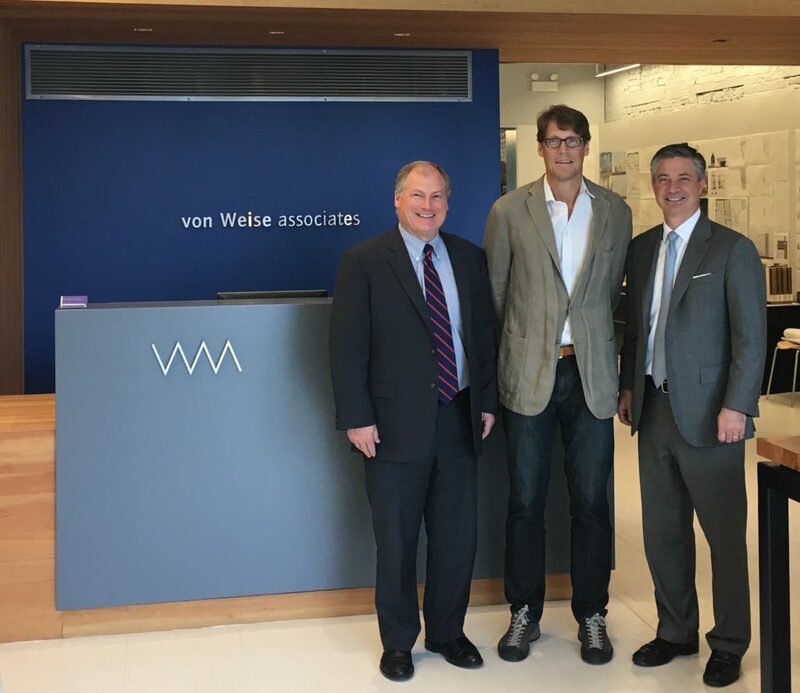 Chief Lending Officer Kevin Murphy (L) and President Michael Busch (R) with Chip von Weise in the VWA offices. 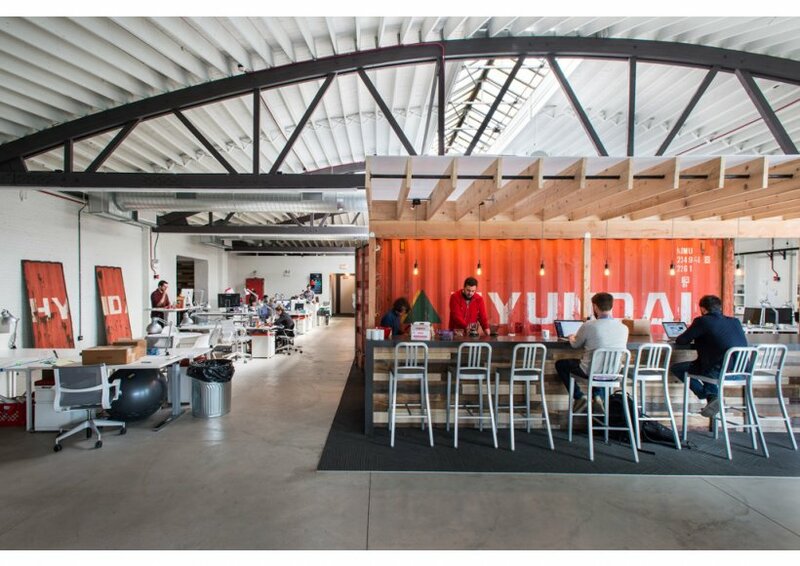 A well-designed space has the power to create cohesion, evoke emotions and stimulate curiosity. Chip von Weise, distinguished architect and founder of von Weise Associates, uses space to his advantage for beautifully crafted commercial and residential designs. Since 1994, von Weise has been a prolific architect completing inspired and striking architectural creations across the world, from Shanghai to Chicago. His work, dedication and valued relationship with Burling Bank makes von Weise a natural choice for this season’s Client Spotlight. Chip von Weise began his architectural work in Boston, MA where he graduated from Harvard University with a Masters in Architecture in 1992 and soon relocated to Chicago. Serving in multiple senior positions beforehand, he started von Weise Associates in 1999 to create ideal family residences, commercial spaces, hotels, corporate interiors and offices. His passion has yielded powerful results, with over seventy residential homes and dozens of notable Chicago buildings including 150 N. Wacker, 200 North LaSalle, the Cards Against Humanity office and the restoration of the Allegro Hotel in his portfolio. Today, the staff at von Weise Associates take a collaborative approach with each new project, developing a personalized relationship with each client from conception to review. von Weise believes that excellent design is derived from a dialogue that occurs with the client throughout the design process. Chip von Weise couldn’t do his work alone and he turns to Burling Bank for funding and interim financing on some projects. In search of a small, knowledgeable bank with a personalized approach, Chip von Weise approached Burling President Michael Busch who eagerly invited him to explore Burling’s offerings. Since then, Burling Bank and von Weise Associates have formed a close working relationship. von Weise looks forward to a long-lasting partnership with Burling Bank, empowering his firm to provide distinct designs and architectural feats for years to come. von Weise’s work extends beyond structures and office spaces – he and his associates impart their knowledge to young architects in training as well. In a fully-fledged architectural program for Virginia Tech students, fourteen students are selected each semester and twenty-eight each year for the opportunity to gain credit and intern throughout Chicago while developing expertise under von Weise’s guidance. 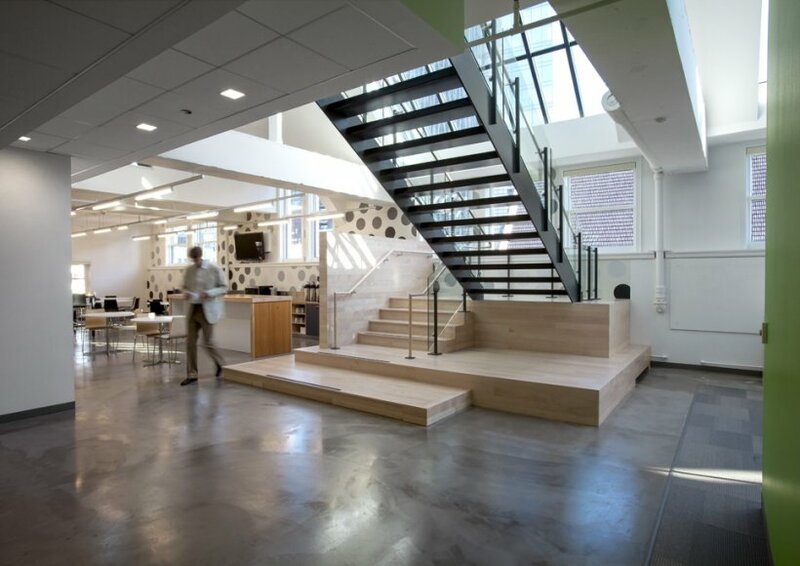 The students are housed in a brand new multi-purpose office building, living in dormitories above the von Weise Associates office with classrooms dotting the building where students learn. In this sleek space, students focus on the importance of design and architectural principles while below, von Weise and his staff prepare designs to be seen across the world. The building itself was a feat, crafted with the sole purpose of multifunctionality. Purchased with the financial expertise of Burling Bank, the new von Weise associates office reflects the needs of students, employees and von Weise himself. Today, von Weise and his collaborators share the space and work toward a stronger architectural future. Burling Bank is honored to work with entrepreneurs and small business owners like Chip von Weise, providing exceptional service and customized solutions to our partners and clients throughout the Chicagoland area. To learn more about von Weise Associates and their unique capabilities as an architectural firm, please click here.